When people used to ask me what I wanted to be when I grew up, I never had a real answer. I knew I wanted a job that would allow me to travel, write, visit castles, meet interesting people, and learn interesting facts. Somehow I stumbled upon just that in this whole musician thing. Which brings me to my next tour ... back to the United Kingdom, mostly Scotland this time. Apologies to my friends in England, but I was only able to make one show fit into the schedule this tour. Special apologies to Cirencester and Crumlin, two of my favorites stops! Maybe help me book something in October? Check back to : http://www.brigidkaelin.com/Site/Tour.html as more details come. I wasn't able to make it to Islay this time around (pictured above ... read "Laphroaig" on a distant building), and I'm bummed about that. But I'm stoked to explore the Hebrides further, with shows on both Mull, Skye, and Bute. As my friend Martin explained many blogs ago, Hebrides Isles (pronounced HEB-ri-deez) actually means "Brigid's Islands" ... which you Gaelic speakers (Hi, Lyzz) can see in the "brid" in "Hebrides." "Brid" is the gaelic spelling of Brigid, which I only know because my college roommate (Hi, Lyzz) took Gaelic one semester and constantly called me "Breed." Anyway, I feel a bit of a connection to the Hebrides, so I'm looking forward to collecting as many islands as possible. After this tour, my total will be four. I hope to bring you lots of blogs and videos from the tour. Any ideas (or other outlets for my writings!) are welcome of course. It's neat living in an old home. My friends in Scotland will be laughing at my definition of old, seeing as my home was built in 1925 and the Edinburgh "New" Town was built in the 1700s. Somehow, those homes are all still standing in all their glory, yet I need new plumbing. I spent the last ten minutes furiously jotting down notes for the plumber as dictated by FWT because FWT is at work and cannot show the plumber the "supply lines" and "drain lines" (which I like to refer to as the "poop pipe"). I almost cried when I couldn't figure out where the rafters were because we'd been referring to them as "joists" all week. I had "joists" perfected, but changing names like that confused me to no end. There are two things in my life that, when put together, make for very awkward conversations with plumbers and electricians. 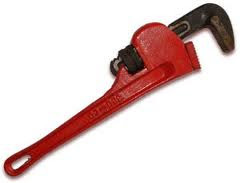 First is having been brought up in a perfectly lovely household where my parents read about a thousand books a week but don't own a monkey wrench. I'm not saying that's a bad thing. Really, it means I now get library books about plumbing rather than unscrewing pipes to see what the problem is. But it doesn't make be very confident about knowing how to fix anything. The second problem is being a girl. Now I know very well that there are plenty of women out there would could plumb circles around FWT, so it's not about women not knowing about plumbing. I just really can't stand being looked at as a stereotypical, silly girl, who knows nothing about home repair, especially when I am living up to that stereotype every second I try to explain the problem to the plumber. I feel like I'm single-handedly proving a chauvinist's point. Our very kind and trustworthy plumber is on his way here, and I am prepared to recite the diligent notes I've taken from FWT. I'm very very nervous. FWT was prepared to make all these repairs himself, but I talked him into hiring a plumber to avoid potential conflict (one friend of ours whose husband re-ran plumbing, brushed her teeth in the kitchen sink for nine months). I'm now regretting that decision. People keep getting on my case about needing to "stop stressing about the wedding." I know they are right, but truthfully, it's not the wedding that's stressing me out. It's maintaining my other life that is frustrating. Being self-employed is hard enough, though I would never trade it for a 9-5. Still, I'm finding it impossible to get art created while I'm caught up in details -- and not just wedding details, but taxes, Quickbooks, returning phone calls and emails, designing posters, mailing posters, blah blah blah. Just the business end of music is a full-time job, and I seem to be falling further and further from the music business forefront. Maybe it's time I went to grad school and wrote a book or something. That seems to be a popular choice these days. I could be just in a funk though. Last week I laid down two scratch tracks at Peter's studio, so I guess that's a start. Anyway ... back to business ... today's task: finish designing the posters for my May United Kingdom Tour, print them out, address envelopes. I'll mail them tomorrow. Isn't the life of a rock star glamorous? Living in a nice, friendly neighborhood is great, but I often forget how many of us still hole up in our homes, giving barely a nod to acknowledge passers-by or other neighbors. It's not as bad as when I lived in New York, but it's still easy to live anonymously -- or at least pretend that you are. This morning I had a nice reminder that we share our living areas. I was out with a cup of decaf (watch out, world!) gathered on a street corner at 7:30 am with several neighbors and our friendly Councilman, the ubiquitous Tom Owen. I'll spare you the details, but the essence is that our block is an accident waiting to happen. There's a wide turn, rather than a sharp corner, no stop sign, and cars FLY around the curve paying no heed to pedestrians or other vehicles. Since so many children live on the street, we've been hoping the city would listen to our pleas, which have included the signatures of just about every homeowner on the block. So we gathered there today to watch cars roll through stop signs while we chatted about the weather. I must admit, I was impressed with our Councilman. I mean, I know he's a nice, well-liked man. He's been my councilperson for as long as I can remember, and I love seeing him out on his bicycle at all hours. I wasn't expecting much out of the morning's meeting, however, because I'd long-heard that the Councilman is not a proponent of speed humps or stop signs. I figured he'd shake our hands, count cars, and say there's nothing he can do. Really though, he took notes, asked questions, discussed potential solutions, and was very honest about budgets and possibilities. More than anything, he listened to our stories and ideas. I shouldn't be so amazed being that that is his job description, but it was a really nice reminder that government is there -- or at least supposed to be there -- to represent constituents like me. It's nice when people surpass your expectations, and it's sad that our expectations are so low. Also, and I know this is sort of a selfish reason to respect the man, but at one point after we'd counted plenty of speeders, he turned to me and said, "Now Brigid, you have GOT to stop stressing out about this wedding." Then a schoolbus arrived and we all remarked how smart it was of the driver to pull into the middle of the street, preventing cars from going around the bus. Granted, FWT works in Metro government, so it's not too far-reaching, but I still never expected the Councilman to remember having met me, of all the people he sees on a daily basis. I meet tons of people when I'm out playing shows, and I have the hardest time remember them, even with the help of Facebook. Good thing I'm not in politics. One final thing I learned from watching traffic between 7:30-8:00 ... since when did 9-5 jobs start starting at 8:00? Ouch. Control issues, Show Thursday, and Starting on Time. I'm playing on Thursday night at the Monkey Wrench as part of the Motherlodge Festivities. If you ask me what Thursday's show will be like, I will tell you that I don't know. I will also tell you that my control issues are flipping out because I don't know. Actually, I'm not sure if it's about control because I don't really care what the vibe or order of the show is. I only want to be forewarned. Is that the same thing? Control versus knowledge? Really, if we're talking about control issues, let's talk about my favorite "cause" in the Louisville music scene: starting shows on time. Anyone who knows me, knows that what I can't stand more than anything (aside from people who turn LEFT onto Eastern Parkway from Bardstown Road -- and SERIOUSLY people, how can you grow up in Louisville and STILL DO THAT???!?!?! ), is when music shows start late. 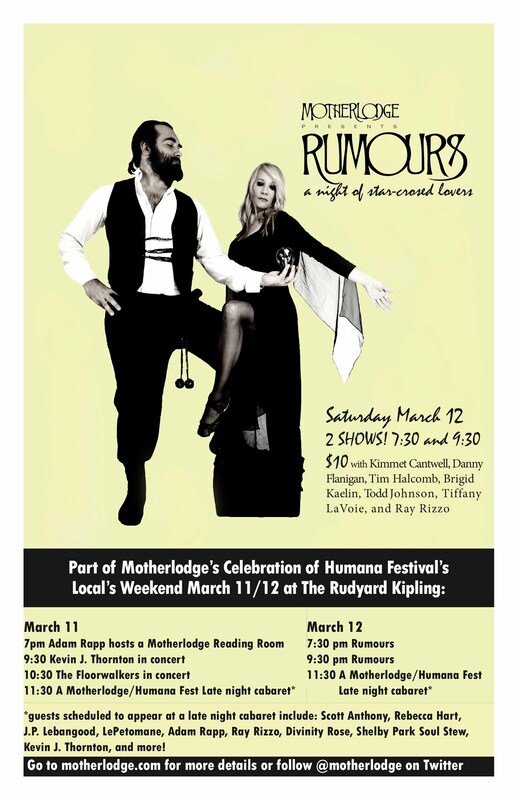 The "Rumours" show a few weeks ago was a prime example. We were all ready at 7:30. The room was packed to standing-room only, and for some reason, the person in charge decided to "hold the show." Why? I have no idea. It wasn't my event, however, so I fumed quietly with another cast member and chanted some sort of mantra about needing to relax and stop being so uptight. But I was quite frustrated because, well, I complain about late-starts all the time, and my mailing list knows this. When they come to a show I'm involved in, they expect it to start on time. When a show starts late, and there's nothing I can do about it .. well ... um, there we go, I suppose. Control issues. This show on Thursday night at the Monkey Wrench is advertised to start at 11:00pm. It declares that I am hosting the evening (actually, the press release calls me the "Queen of the Highlands," which I sort of love ... browsing tiaras as I type), which makes me think I may actually be able to start the event at 11:00. Of course, I'm not really sure what "hosting" refers to in this case, and I haven't met the other acts on the bill. I sent them an email explaining my obsession with starting on-time and my willingness to go first even if that meant singing to an empty room just on principle, so now they probably think I'm some psycho-uptight freak, and not some cool, laid-back musician. I swear I'm laid-back about most things, but just not about my JOB. And really, isn't that what it comes down to? When people pay a cover, they are essentially paying for your professional services. If you wanted to be treated and respected like a professional, you should, um, not be late to work, right? And be nice and respectful to your clients? The other folks on the bill, Xylos and Miss Tess, are coming down from New York, where they are professional, touring musicians. They are also quite good, and I'm hoping they think I'm crazy -- not because I want to start the show on time, but because I even hinted that we might NOT start on time. Anyway, I promise there will be SOME form of entertainment at 11:00 on Thursday, even if it's just me Riverdancing to an empty room. Also, the whole time I've been writing this blog, I've been listening online to Miss Tess, whom I now sort of love, and who must also now think I am a total psycho. See y'all Thursday? If it's 11:00 and I'm not playing, someone please slip a Xanax in my bourbon. I slept for fourteen hours straight last night. I didn't even make it through one episode of "Boy Meets World (an unfortunate Netflix Queue incident) before I was just passed out completely. I blame two things: first, a marathon of shows this weekend, and second, our bizarre decision to make noodles from scratch on a Sunday afternoon. We acquired one of those old-fashioned hand-cranked pasta makers from a friend who, I think, got it for her wedding fifteen years ago and never even opened it. I've been wanting to use it for months now, more than anything for Joy's cracker recipe. We don't own a good rolling pin, and I like my crackers thin. 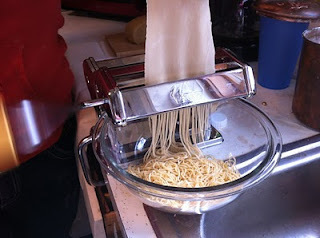 But yesterday it just seemed like, rather than cleaning the house, we really should be making noodles. When the pantry gets down to two tubes of vegemite and a soft potato, it's clearly time to go to the grocery. Unless you can postpone it with some flour and eggs. I know I shouldn't be amazed by things like this. In fact, it makes me feel like those kids on TV who can't identify a potato, but can name several varieties of french fries. Still, I can't believe how easy it was to mix together flour and eggs, run it through the crank a few times, and voila! ... noodles. The problem, however, is that in addition to it taking about the same amount of time as throwing a box of pasta in boiling water (the actual cooking time for the angel hair we made was about 60 seconds), it tastes approximately one thousand times better than boxed pasta. That is not at all surprising. Everything tastes better without chemicals. What's surprising is that more people don't make noodles every week. I mean, 3 cups of flour and 4-5 eggs. That's it. Scientifically speaking, I think the fact that FWT and I ate about a pound of noodles last night with several sauces we had in the freezer, may have something to do with why I was asleep by 7:30. You'd think with that carbo-loading, I'd be ready to run a marathon this morning. But it's raining, so I think I'll just have some more noodles and catch up on "Boy Meets World." Learning this album has been a lot more work for me than it should be, mostly because I just really never listened to Fleetwood Mac. Sure, I listened to classic rock radio stations as a kid, but I swear I don't remember ever hearing Fleetwood Mac songs. I know that's really weird for most of you to believe, but I think I've mostly heard Fleetwood Mac at karaoke, not even knowing who the original was done by. Also, it's weird having to actually learn a cover song note for note, rather than just doing your own interpretation. I can learn most songs -- at least the instrumental parts -- with only one listen because my brain thinks in harmonies. Harmonies are easy to memorize because they are usually very simple. This, however, is totally different in that I'm having to learn Christine McVie's piano/organ/keyboard parts note-for-note, exactly like the record, memorize it, and then also sing all the right words, not to mention the right notes, without a cheat sheet. A few months ago I had this gaping hole in my musical history knowledge, and now suddenly, I know this album in and out and have wurlitzer/clavinet pre-sets programmed into my keyboard labeled "You Make Loving Fun." I like the songs, and I especially like the arrangements and production. It makes a huge difference listening to a record with my good headphones, rather than the dumb earbuds that essentially leave out all the electric piano parts. Sure, I look like a big dork when I'm walking around the neighborhood with my giant noise-canceling headphones on, but it's been a nice study. 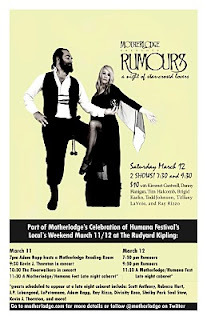 I'm also amazed by how easy it is to work with the other five musicians playing in this "Rumours" reenactment. Not only are they all absolute pros and sickeningly talented, but they are all, well, nice. You might think that throwing the six of us on a stage without a musical director -- or at least without a certain person deemed the leader -- would be disastrous. But there's been nothing but ideas, praise, modesty, and unbelievable talent. No egos or personality clashes -- just music. It's great. You should come to the show. Kimmet Cantwell will convince you that you're seeing Stevie Nicks in person. Danny Flanigan and Todd Johnson have somehow managed to get the exact same guitar tones and solos and play together so minimally and perfect you won't even notice how hard they've worked. Tim Halcomb plays the complicated bass parts so well and keeps us on task in rehearsal, and Ray Rizzo on drums just brings it all together... both spiritually and musically. Tiffany LaVoie will be on-hand with some engaging and fun theater while we're flipping from Side A to Side B. See you there. I've come out of hibernation over the past couple of weeks, and you may have even spotted me ... wait for it ... out in public. As in having a cocktail with friends at an event I didn't have to work. This is a big deal, especially after a year of scrimping, saving, teaching more than I'd like, and playing many fewer shows than I'd like. No more, folks, no more! Otherwise, hang out, have a cocktail or a mocktail, and listen to my brilliant band play. Save 15% on the majority of seats for this performance. Use promotion code FIDDLE online, by phone and in-person at The Kentucky Center box office. Discount cannot be applied to previous purchases. Description: How good is Irish fiddler Eileen Ivers? How about winning the all-Ireland Fiddle Championship nine times? How about being called "the future of the Celtic fiddle" by the Washington Post? Or dubbed "the Jimi Hendrix of the violin" by The New York Times? 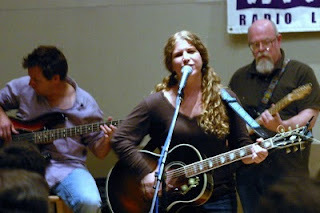 Ivers will tear up the Bomhard stage with her electric, frenetic, inspired playing that mixes traditional Celtic with jazz, World, and rock influences. Come early, stay late! Join us for free pre-show entertainment in The Kentucky Center Bar starting around 7 p.m. with local alt-country cabaret performer Brigid Kaelin and her band. Brigid is a talented multi-instrumentalist who plays guitar, piano, accordion and a mean musical saw! Ticketing: Standard ticket prices are $25, $30, reserved seating, fees apply. Standard tickets are available online, by phone (502.584.7777, 502.562.0730 TTY), and in-person at The Kentucky Center box office. After tonight's show, your Eileen Ivers ticket stub gets you 10% off at Patrick O'Shea's! Supportive Friends= Lying friends. In the Kitchen, anyway. I always thought I was a pretty decent cook. I'm starting to think I just have really supportive friends. This doesn't bode well for my art, either, now that I think of it. Really though, I've tried two new recipes this week, and they were just awful. I don't blame the recipes though because I didn't follow them to a tee (typical). Who has "mixed spice" lying around the house anyway, unless you live in Britain? My substitution of cloves, cinnamon, and nutmeg, was way off in its proportions, and I had to douse my vegetarian haggis in salt to make up for the sweetitude that overwhelmed it. And let's not even begin to discuss my sad attempt at fresh vegetable soup on Monday. Someone, please help me ... I swear, I'll really try my best to measure things if you can guide me to a filling spring soup or a vegetarian haggis recipe that tastes like the one they serve at the Baked Potato Shop on Cockburn Street in Edinburgh.